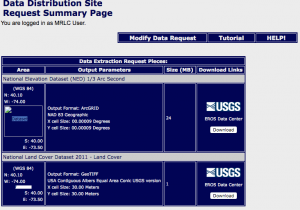 The USGS National Elevation Dataset (NED) is the main source of elevation data, and is available for the entire US. The NED contains 1 arc second (30m), 1/3 arc second (10m) and 1/10 arc second (3m). For selected sites, you may find 1 m and 5 m data. 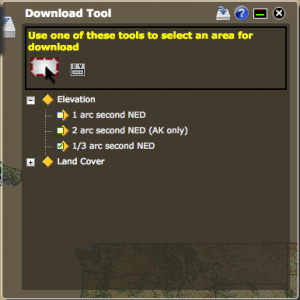 Please following the steps illustrated below to download NED files in GeoTiff format for AERMAP and AERMOD. 2. 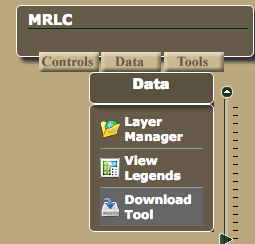 Click Data and then Download Tool. 3. Select “1/3 arc second NED” (the most common option) and click the floppy disk icon. 4. After clicking the floppy disk icon, a window will pop up that says “Enter the limits for a new area”. 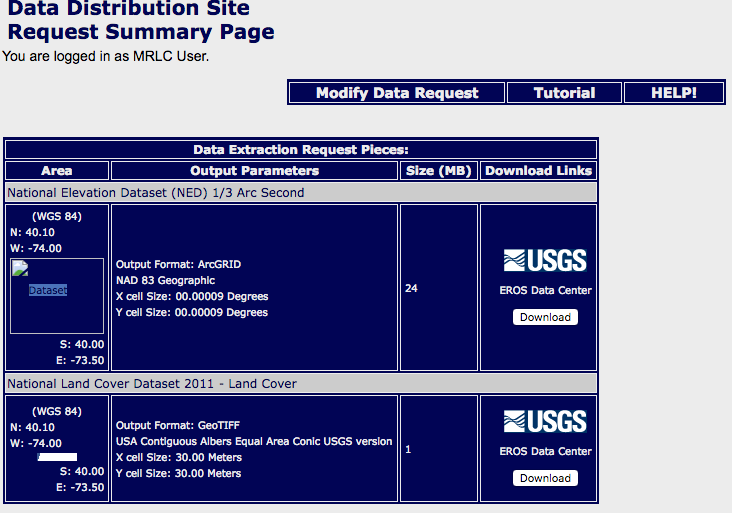 Then enter the four coordinates that identify the site in the appropriate fields. 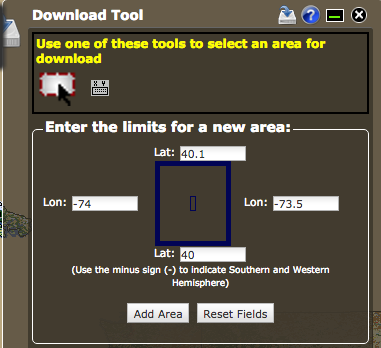 After you have entered the coordinates, click the “Add Area” button. 5. The browser displays a page that says “Data Distribution Site Request Summary Page”. The default output format is listed as ArcGRID. Since AERMAP requires GeoTIFF, you must change the output type. Click the “Modify Data Request”. 6. The browser displays a list of available formats. In the Elevation section, locate the National Elevation Dataset (NED) entry, and place a check in the checkbox of the appropriate Arc Second setting (1, 1/3, or 1/9). From the Data Format drop-down list, select GeoTIFF. 7. Click “Save Changes & Return to Summary”. 8. The browser goes back to the summary page. Once verifying the details, click “Download”. The data is downloaded as a zipped file. Unzip the file, and you can see the “tif” file in the folder.